"The demonic forces in the haunted Long Island house escape through a mystical lamp which finds its way to a remote California mansion where the evil manipulates a little girl by manifesting itself in the form of her dead father." If I have one horror movie in my collection which I can describe as a "guilty pleasure", it's this one. 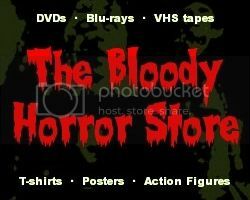 Back in the '80s I was into all things "Amityville" and when the chance came to buy this "Medusa Pictures" release on VHS from Blockbuster, I was parting with my £4.99 for the previewed tape before you could say, "Stock Clearance Sale". The funny thing was that I don't think that I ever watched it more than a couple of times again. Since I upgraded to the DVD version fairly recently, before I discovered that "Amityville 4: The Evil Escapes" was actually a made-for-TV movie, I was really looking forward to nostalgically revisiting my teenage obsession. Oh, how I wish that I hadn't! The problem with "Amityville 4" is not that the plot is completely ridiculous. I've heard stories on Talk Radio about people buying haunted objects before now which really put the willies up me and I don't rule anything out when it comes to the supernatural. No, the terrible thing about "Amityville 4" is that it just isn't a very scary film at all especially now that I know why the horror elements were so toned down. Through a mixture of false memories involving "The Blob" (1988), I remembered the hand down the waste disposal scene as being much gorier than it actually was. Seeing how contrived it all was now makes the scene totally cringeworthy rather than horrible. If the "MST3K" guys ever got hold of this film then I'm sure they'd be saying the same things as me to the line, "He'll live." Yeah, he'll live but with a hook for a hand! Other ridiculous moments abound including a knife with blood on it that disappears and then reappears again, a floor lamp with possibly the longest electrical cord on it ever, and an actor (now famous for being a certain "Star Trek" character) playing a child though he is obviously in his mid-20s. Also the acting, without a shadow of a doubt, is a bit horrible. Continuity-wise, "Amityville 4" ignores all the other sequels and has a beginning which is based very loosely on the alleged yard sale which the Lutzes had a few months after fleeing their famous Long Island address. It's just as well really since "Amityville III" had the whole building explode and burn. I suppose you could place "Amityville 4" as a kind of prequel to the events of "Amityville III" if you twist logic enough to suggest that more than one demon was inhabiting the house. Biblically, there is a demon called "Legion" so by all means use that as an example if you wish. It's probably best to not try to overthink "Amityville 4" as it really doesn't stand up to a lot of analysis. As a watered-down version of the original with as much gore as the TV censors would allow, it's entertaining enough but it has become rather dated. Like 99.9% of horror films, "Amityville 4" is simply a product rather than a work of art and has to be viewed accordingly. I suppose, at the time, I really must have liked Zoe Trilling who stars as Amanda Evans (though she appears on the credits as Geri Betzler). Now all I see is her awful '80s perm though it's not nearly as bad as the haircut on Aron Eisenberg who plays her brother, Brian Evans. Think Corey Haim from "The Lost Boys" (1987) but with even less fashion sense. "Amityville 4" isn't all that bad technically. It looks ok but it's obviously not as a widescreen version on the DVD due to the time and format it was made in. The sound seems to be mono too which is not unexpected. Since I no longer have the VHS version I can't compare the two but I'm sure the videotape was in mono as well. Without spoiling it for you, I'll just tell you that ending must have influenced "Fallen" (1998) though, since "Fallen" homages "The First Power" (1990) and "The Hidden" (1987) among others, I can't say for sure. Transmigration has been used a lot of times in horror and sci-fi movies over the years but the vessel in this case makes me very suspicious. Anyway, "Amityville 4" is a former member of The Vault which I'm now moving into the Just Average section. It's not a truly awful film like "Amityville III" (though I've probably made it sound like it is) but it's a bit tame and adds nothing new to the haunted house subgenre.